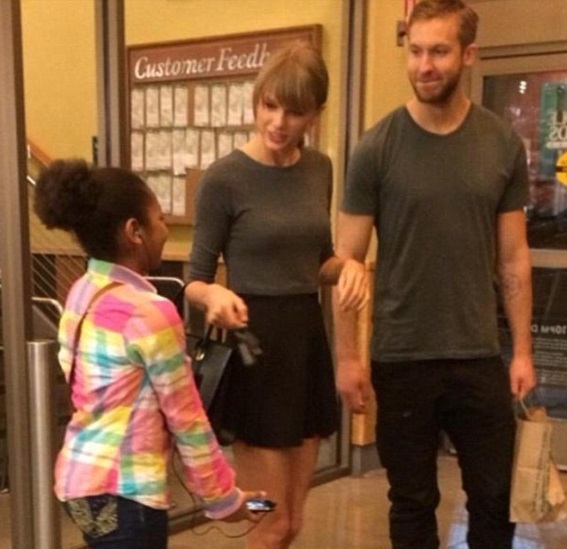 Here they are, purportedly in a Whole Foods, looking on trend with their matching tees. This isn’t hideous. Now if they were wearing those, “I’m with stupid —->” shirts, I would think differently. I did think it was a bit too precious when I first saw it, but then I reminded myself that I did the matchy-matchy thing with my husband–then boyfriend–right from the start. Everything I wore matched him. And all the gals in the office where I worked. And my boss in that office. And HIS boss as well. I was in the Air Force and you were either wearing olive drab or a two-toned blue uniform. Olive drab looks better on Taylor Swift than it did on me. That’s one thing about the Regency, there was no couples dressing alike. Not for long, anyway. *His name is Calvin Harris. It was right on the picture title.